This place changes by the month. I'm sure it's the fastest changing city in the Gulf. The speedy change usually kills any soul of the older places, but here they're a bit more aware of its importance. The area of Souq Waqif has been restored and extended beautifully. Just to give you a flavour of the pace this city has, take a look at the photograph below. About eight years ago, I used to stay at the pyramid shaped hotel, the Sheraton, on the far right. Back then, there was almost nothing on the left. It now houses the new and shiny downtown (West Bay) area which is not yet fully completed. 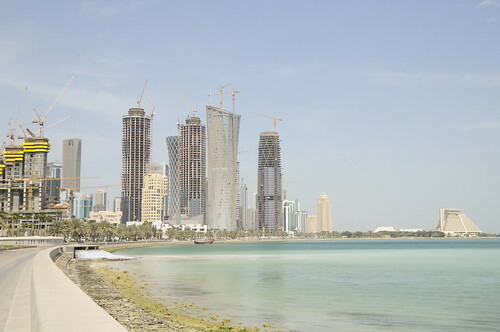 There are also two major projects; Lusail and The Pearl. These are new cities not far from Doha! I have had an unusually successful trip. It's not often one manages to check all items off a to-do list. With god's blessing, I managed to unstick a very sticky business deal, I stayed awake (barely) during the many long meetings yesterday, and from a personal side, I got to see the Museum of Islamic Art. I have to check-out of my hotel now if I'm to get to my flight on time, so that will be the subject of my next post when I return home. For a moment I thought you were talking about the Kuwait Old Souk. The street looks same. Pyramid building looks like the Pyramid mosque at Salmiya right after the Scientific Centre signal! I've noticed these things too ..
it's a big change for me and for everyone who visit Doha frequently .. Very good first picture. What camera do you use? It's a little similar. Yes. In a relatively short interval, big changes happen. Not quite - but you know.